1:Prepared large pot with water at high heat for butter squashnut.Cook the squash in rolling boil water for 15 minutes each side or until tender.Remove the squash from pot ,then remove the skin, scrape out seeds.Cut the squash 1 inch each . 2:Preheat oven at 350F.Marinate brown sugar,cinnamon,salt,olive oil,cumin and Italian herbs over buttersquash nut in casserole .Bake for 45 minutes or until golden brown.Serve warm as side order. I'm submitting this recipe to Weekend Wokking , a world-wide food blogging event created by Wandering Chopsticks celebrating the multiple ways we can cook one ingredient. The host this month is Heart and Hearth and the secret ingredient is Pumpkin. I hope she don't mind I used Squash as Pumpkin as we all know squash is another member in pumpkin family .The dateline for submission will be on the 3rd November 2008. See yea! This will be great side dishe for Thanksgiving dinner. I always like pumpkin and sweet potatoes but not Carlos. I like the sound of roasting butternut squash with cinnamon. oh oh oh...loving this....hmmm simple and must be good! this looks like a great side dish for thanksgiving hehe..
Me too not pumpkin or squash fan but hubby love it dearly! too bad I 'm not pumpkin fan but love sweet potatoes especially the Japanese type! 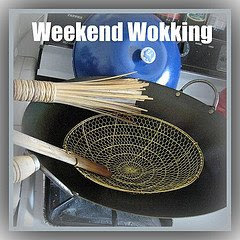 Thanks for submitting to Weekend Wokking!